Contemporary and smart, with sleek lines and stylish cuts, our square edge and flat panel kitchen cupboard door offering has something for everyone, from the most budget conscious to those seeking the latest technology in innovative surfaces. An expansively diverse range of materials, colours, and textures are available within this range. Melamine doors provide a durable, hygienic, low maintenance solution, resistant to moisture, steam and humidity. 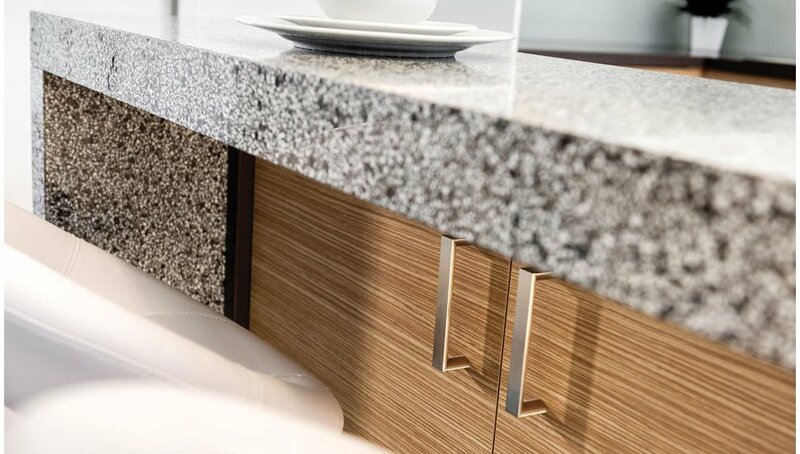 Cut and edges with a 1mm thick ABS edging, these robust doors are available in a wide range of finishes, including Ashgrain, Finegrain, Flint, Gloss, Matt, Natural, Pearl, Sheen, Silk and Texture options, in both solid and woodgrain colours. Ultraglaze gloss doors provide an unsurpassed level of reflection, which is mirror-like in appearance. Finished with an acrylic surface, these doors provide the added benefit of being able to polish out minor inperfections that may develop over time. These doors are finished with a 1mm thick ABS edging, as well as selected colours being available with laser edge, or unique glass bead edge options. The Ultraglaze doors are available in solid and metallic colours. Createc gloss doors have a sophisticated ultra high gloss appearance due to their polyurethane lacquered surface, which is finished with a unique UV-curing process. This provides for an exceptionally durable surface. These doors are available with a 1mm thick ABS edging, and have a wide range of available colours, including solid, pearlescent and woodgrain options. Legato doors offer a unique super matt finish, which is non-reflective and silky smooth to touch. This understated door is available with a 1mm ABS edging, and is available in a range of solid and light woodgrain colour options. Ravine doors offer a unique, embossed finish, which are designed as an attractive alternative to timber veneer, whilst still providing the same look and feel. Boasting warmth, character and dimension, these doors will provide a statement on their own, as well as when used as a contrast option. Available with a matching embossed 1mm ABS edging, Ravine doors are available in a myriad of woodgrain colour options. Riven doors add depth and elegance to woodgrain and linear patterns. With their tactile brushed effect, they provide warmth and depth to vertical panels and doors, offering an affordable alternative to timber veneer. Also available in selected solid colours, Riven doors offer the unique impression of painted wood. Riven doors are finished with matching embossed 1mm ABS edging. Nuance doors provide a realistic alternative to timber veneer. By adding dimension and style to woodgrain and linear patterns, Nuance doors offer a tactile surface with a charmingly natural look and feel. Also available in bold and bright colours, Nuance doors create the striking impression of painted wood features. Nuance doors are finished with a matching 1mm ABS edging, embossed in the same texture to complement this contemporary look. Crystalgloss doors offer striking high gloss finishes, available in both solid and woodgrain colours, providing clear and selected metallic surface finish options. Finished using the latest in automotive paint-finish technology, Crystalgloss doors offer outstandin durability. To complete this sophisticated look, Crystalgloss doors are finished with a matching lustrous 1mm ABS edging. Offering a combination of affordability and design, thermolaminated doors are available in a vast range of textures, colours and door profiles, allowing you to select a combination of each to easily reflect your personal style. From sleek, contemporary minimalistic designs, to the more traditional look of country style doors, our range of thermolaminated doors offer a profile option for any aesthetic brief. All of our thermolaminated doors are non-porous, easy to clean and will retain their beauty, providing for years of trouble-free use. Available in finishes including Matt, Gloss, Texture, Satin, Ashgrain, as well as the amazing range of Natura and Ravine textures, this expansive range is complemented further by a selection of decorative flutes, capping and mouldings to complete your ideal look. Our range of painted doors are manufactured using a technologically advances 2-Pac polyurethane paint, which results in a surface that is easy to clean and has an extraordinary resistance to moisture. Available in a range of sophisticated door profile options, from elegant contemporary simplicity, to rich colonial character shaped doors, the painted door range is further complemented by capping and moulding options which allow a unique design statement. The painted door range is available in a wide range of colours to suit the most minimalist design, right through to those who dare to be bolder, and is complemented by a range of finishes including Gloss, Satin and Texture. For those seeking a more traditionally styled look, our timber door range provides warmth and a naturally luxurious feel. Available in favourite timbers such as Jarrah, Marri and Victorian Ash, as well as an extensive range of exotic woods, these handcrafted doors are available in a variety of profile and edge details, sure to suit the most sophisticated style. Our exclusive range of painted glass doors will provide a striking option for any home. For those seeking the ultimate in durability, non-porosity, and ease of cleaning that glass offers, we have developed our painted glass doors to offer a mirror-like finish to suit a strictly contemporary style. Available in an amazing vibrant and sophisticated range of colours, our painted glass make a definite statement. Available in both Brushed Stainless Steel and Satin Aluminium frame colour options, we have a number of slimline, wide, or shadowline door profiles available. These are further complemented by an array of glass inserts, which include Frosted, Starphire White, Mirror or Clear options. The aluminium framed door range also offers suitability for undercover outdoor applications, providing an excellent solution to those wishing to extend the look and feel of their inside space to the outdoors. Available Compact Laminate inserts offer a waterproof, impact resistant and elegant solution to any area requiring a hardier resilience. Furthermore, the compact laminate colour range is designed to match many of the existing colour ranges available in our square edge and thermolaminated selections. Designed primarily for use in outdoor applications, our solid acrylic doors are made to be hardwearing, durable, moisture proof and hygienic. As these doors are UV stable, they are ideal for external applications. Furthermore, in the unlikely event that these doors become slightly scratched or damaged in the future, these minor imperfections may be buffed out and repaired on the existing door. These doors are available in a comprehensive range of colours, finished with a High Gloss surface appearance. Designed to match your work surfaces, our stone and solid surface door range is available in a range of colours and finishes, sure to provide the ultimate in complementary design statements. Available in textured and gloss finishes, the colour range varies from the minimalistic through to the unique natural appeal of marble and granite statement pieces. These can be grain matched to provide a completely seamless transition from your work surface to your doors. Cool to touch, and providing exceptional resistance to daily use, our stone and solid surface door range provide an alternative that is sure to resonate beauty, exclusivity and individuality for the most sophisticated space. Our custom printed door range offers the ultimate in personal design statement, without compromising on existing methods of cabinet and door construction. Whilst these doors are not suitable for high traffic areas, these provide an opportunity for you to select a custom print or photograph of your choice, and have that image presented on the front of a usable kitchen cabinet. Custom printed doors are extremely affordable way to showcase your favourite image or memory as a design feature within your kitchen, or a great way to provide feature to an area within your home that could benefit from some additional storage and aesthetic appeal.